A scientist at NASA has warned that space will witness a mini ice age due to the decline in sunspot activity. Space will witness a mini ice age in the coming months due to the drastic drop in sunspot activity, NASA has warned. The study led by Martin Mlynczak of NASA's Langley Research Center believes that the sunspot activity on the surface of our star has become so low, and it could trigger a record low in space temperature in the upcoming months. "We see a cooling trend. High above Earth's surface, near the edge of space, our atmosphere is losing heat energy. If current trends continue, it could soon set a Space Age record for cold," said Mlynczak, Fox News reports. Last year, NASA had revealed that sunspot activities are going to witness an all-time low in 2019-2020. As per NASA, a solar minimum could drastically change the weather in space, disrupt communication and navigation, and sometimes, it may even cause space junk to hang around. "There are unique space weather effects that get stronger during solar minimum. For example, the number of galactic cosmic rays that reach Earth's upper atmosphere increases during solar minimum. Galactic cosmic rays are high energy particles accelerated toward the solar system by distant supernova explosions and other violent events in the galaxy," says NASA. Dean Pesnell of NASA's Goddard Space Flight Center in Greenbelt reveals that solar minimum is a regular part of the sunspot cycle. Presnell argues that the sun's magnetic field will weaken during solar minimum, and it will provide less shielding from cosmic rays, thus posing an increased threat to astronauts travelling through space. It was from 1645 to 1715 that the sun went through a record solar minimum. Sunspots were extremely rare during this period, and it literally pulled Europe and North America to a mini ice age. However, many experts believe that a volcanic action was the cause of this ice age, and they claim that the solar minimum was actually a contributing factor that reduced the temperature to extremely low levels. A day back, a team of International researchers had predicted that a dangerous solar storm could hit earth on November 18, 2018. 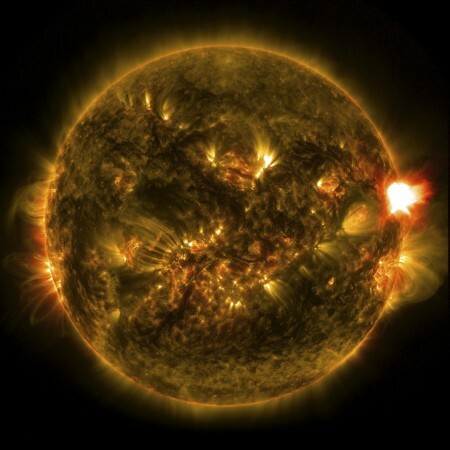 As per experts, this upcoming solar storm may result in serious consequences like satellite and internet blackout.